WORK on a major public realm scheme at Irish Street in Downpatrick is to take more than twice as long to complete than originally planned, sparking a furious reaction from traders. CLERGY and Christians turned out to support a cross-community church walk on Good Friday in Castlewellan – just days after the event had been denounced by Free Presbyterian ministers. HUNDREDS of terrified holidaymakers in Newcastle were forced to flee on Sunday evening as high winds drove a ferocious gorse fire — which had been started deliberately — perilously close to their caravans at the foot of the Mournes. SOME weeks ago the Department of Health published a consultation document on breast cancer assessment services in Northern Ireland. 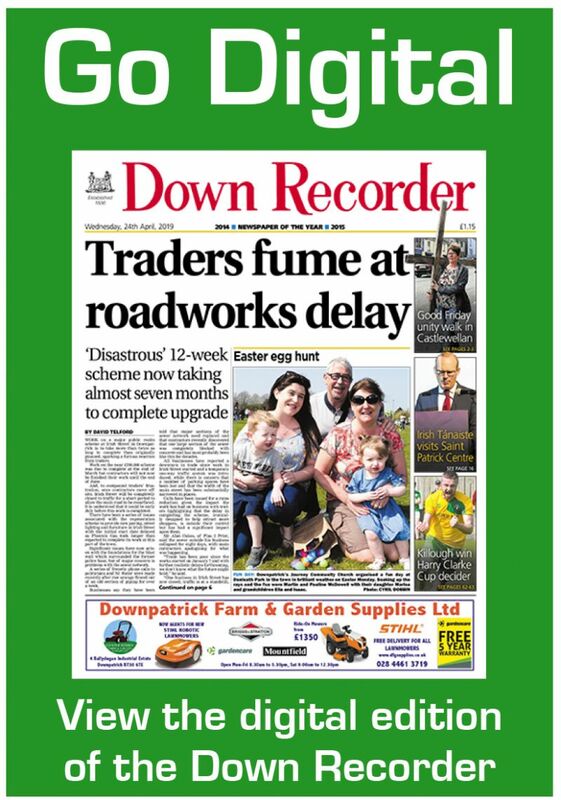 CONCERN has been expressed after Strangford village was brought to a standstill by traffic congestion on Saturday evening. THE Downe Hospital’s new specialist centre of excellence for cataract surgery is up and running. BUILDING work on a new social housing project at the old Downe Hospital site in Downpatrick is due to resume in the near future. SHIMNA Stars is celebrating a mammoth win after clinching four gold medals and four silver at the recent Basketball Special Olympics Ulster Skills final. NEWRY, Mourne and Down Council has opened books of condolences to allow local people to record their thoughts and extend sympathy to the family and friends of investigative journalist Lyra McKee. A VORACIOUS and highly-motivated Killough side wreaked havoc on Ballynagross on their way to lifting the Harry Clarke Cup at a sun-kissed Meadowvale on Easter Monday. THE new cricket season gets underway on Saturday. KILLYLEAGH YC are back in the football big time. AN electrifying finish from holders Monaghan just about finished off a gallant Down challenge at a positively balmy St Tiernach’s Park, Clones, on Saturday evening. BALLYMACARN Park was bathed in sunshine as the talented ‘Hinch U-16 squad battled with Virginia for a place in the showpiece Ulster Carpets Cup final at Kingspan Stadium. FORMER Hill and Dale champion Seamus Lynch made his first appearance of the series and he proved he is back to his best, with a gun to tape win. IRISH Tánaiste Simon Coveney was in Downpatrick last week for a special visit, with his first stop the St Patrick Centre. A BALLYGOWAN girl is in the running to be crowned Miss Northern Ireland. A HUGELY popular BBC Northern Ireland rural affairs programme is to be broadcast live from the shores of Strangford Lough next month. A STUDENT and upcoming politician at Downpatrick’s St Patrick’s Grammar School recently won two prestigious awards in consecutive days. A STUNNING new publication featuring a number of local landmarks is set to be unveiled next month.